I haven’t been blogging much lately. In fact, the Lucketts fair really wore me out. That and everything else that has been going on. I am currently “on vacation” but I thought it would be fun to show you the last few projects I finished before I headed out to Nebraska. 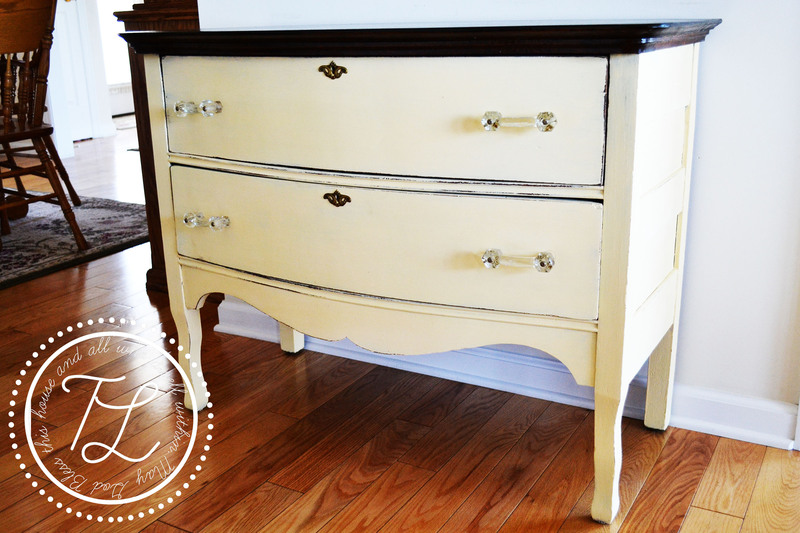 The first picture is of a sweet little dresser that I painted for a friend of mine. She wanted something small to put gloves and hats in, and it fit perfectly in the space! The yellow is pale and soft, and looks great with the rest of Kelly’s decor. She also shared a pic on Facebook of the cute way she decorated the top. Kelly is quite the decorator herself. And soon I hope to share with you one of her cute projects. 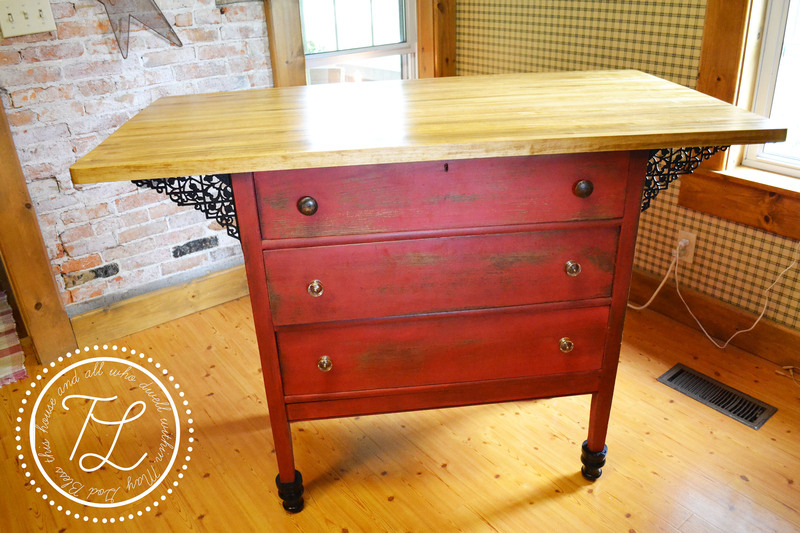 The next piece is a custom kitchen island made from a vintage dresser. I have made a couple of these, and this one turned out so lovely! The new owner of this island, Jean contacted me back in March via my Etsy site to see if I could make something that would work in her kitchen. She wanted to make the top larger so that people could sit around it on three sides. So I went to work and found the perfect dresser base at an auction. Jean picked red for the dresser color and I used Miss Mustard Seed’s tricycle red. 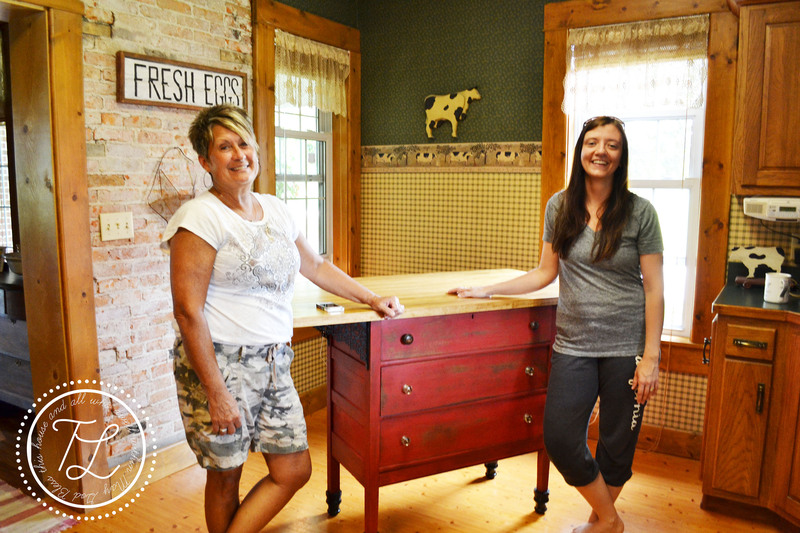 We added feet and brackets and Hood Contracting made the custom butcher block top. It all came together beautifully, but the unusual thing about this custom piece was that its new home was in Elkhart, Indiana, a 10 hour drive from my home. As it turned out I was going to be driving through Indiana on my way to Nebraska. This was my first Etsy item that I was actually going to see where it was going to be living! So this past Saturday I was able to personally drop it off at her home. Jean is such a sweet lady and her family was so welcoming. They live on a picture perfect farm that would truly be my dream home! It was an unexpected gift to make new friends all over the country! Something I didn’t even consider when I started my little furniture business, but now it has become one of the main reason why I continue to do it. And the last pic is of Jean and myself. And yes that is me after a 10 hour drive in a van with three kids and a husband! But the island could not have looked better in her kitchen. I once read an article about a guy who visited all the people who bought his items off of Ebay. I think it would be fun to visit others who have bought things from me and see where they ended up in their homes. So if you have bought something from me, send me a pic of where it is in your house and maybe I will be able to come visit! After all, it is about making new friends along the way. This entry was tagged custom kitchen island. Bookmark the permalink. love both pieces and you still look adorable! You did a beautiful job. I’m sure that she was very pleased with your work and her purchase. It certainly belongs in her home.